Was Yesterday Carmelo’s Last Moment of Triumph? In case you were doing, oh, anything else with your life on Friday night, the Jets played their first preseason game and, hey, guess who the story was about? C'mon, just guess. 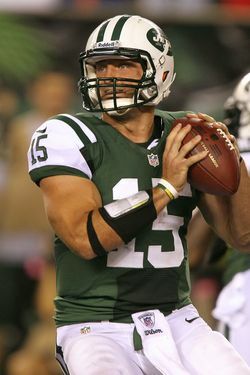 When the offense looked as bad as it did, the question arises: If it's that bad all year, shouldn't Tebow just take over? These are the type of questions that pop up during preseason. Exhibition games don't give you much to work with. This is, of course, what's going to happen every time Tebow does anything, good or bad, quarterback or otherwise: People are going to speculate — not just media, but players and fans and anyone keeping so much as a cursory eye on the team — about what it means for Mark Sanchez. (Who threw six passes and completed four of them on Friday.) This is the reason the trade for Tebow was seen as so odd in the first place. The Jets have always insisted that Sanchez is their quarterback and will remain their quarterback, and why are you people asking about Tebow, that's so strange, stop that. And no one ever, ever believes them. The Jets' next exhibition is Saturday night against the Giants, when we get to go through all this again.